Touchless Kitchen faucets are one of the latest evolution in the faucet market. With the help of these faucets. You can operate a faucet without even touching it. Now, the question is, how do touchless faucets work? Well, these faucets feature a proximity sensor and mechanism that opens the valve to allow water flow in the presence of something in close proximity. The faucet closes the valve again after a few seconds or when it no longer detects the presence of that thing. The best touchless faucets allow you great convenience, and as you do not even need to touch them with your hands, it stays clean and hygienic. Also, the futuristic design brings elegance to your home. Let us go back through the history now. You would be surprised to know that faucets were invented in as early as 1700 BC. Historically, the Romans made the most development and progress to plumbing. Their plumbing featured faucets in public baths and even private baths to villas. After their decline, the first mentionable development regarding this was the invention of Quaturn Catridge in 1913, which allowed to start the flow of water in one-quarter turn and to stop it needed a two-quarter turn. Since then faucets went through a lot of evolutions. In 2008, Delta Faucet introduced the first touch faucet to the residential market. Touchless faucets followed shortly after years of almost exclusive use in commercial settings, such as airport lavatories. This is not indeed an easy task to choose the appropriate touchless faucet that will best match your needs and requirements, because there are indeed a lot of options available in the market with exclusive features and attractive looks. To help you get rid of the confusion, here we present an overview of the best touchless faucets to you so that you can know about them well and make the best decision. How Do We Pick The Best Touchless Faucets? In case you are thinking about selecting the best touchless faucet, the first thing you need to consider is the sink configuration and the size of the bathroom. Whether you are currently using an existing sink or buying a new one, and where are the faucet opening, these things are also important things that you need to keep in your mind. The one with an easy installation process should be in your preference too. What features do you want and how much that would cost you is also an important thing to consider? Well, how can you ignore the basics? 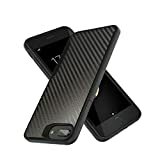 The design, material, and durability are definitely some of the major issues. I hope I was able to state all the facts that you need to consider. Now it is your turn to follow them. We hope that following our remarks; you will be able to choose the best touchless faucets for you. Moen Arbor Motionsense Touchless Pulldown Kitchen Faucet provides you with the convenience of having a faucet that can sense what you are trying to do and respond to what you need. It can be possible because of the two powerful motion sensors that activate flow based on simple hand movements. This touchless faucet has a beautiful sleek design. The 68-inch spray hose is integrated with a “reflex system” that makes it easy to pull, use, angle, aim and re-dock when you are done. The convenient, hands-free control of Moen Arbor Motionsense Touchless Pulldown Kitchen Faucet allows you to accomplish your tasks with greater speed and efficiency. MotionSense delivers convenience on demand. You might occasionally get wet if you come near the faucet, even though you do not want to use it. To get rid of this, just aim the faucet sidewards. Without this, no other downside of this product is mentionable. Unless you crave for a high-powered, military-grade faucet, Moen Arbor should be more than enough for you. Would not it be awesome if you could have a combination of traditional elegance and modern features in your faucets? 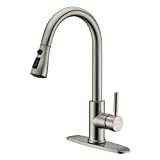 Moen Brantford Touchless Pulldown Kitchen FaucetThis kitchen faucet is something that offers you the exact same thing. Its MotionSense technology enables convenient hands-free operation. A pause function immediately interrupts further water flow to save water. The flexible pulldown hose allows an expanded range of movement. The two sprays let you do the cleaning with ease, while Duralock quick connects system provides a quick and easy installation. 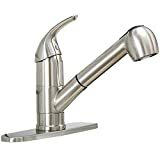 If we summarize, Moen Brantford Touchless Pulldown Kitchen Faucet is something that brings elegance to your kitchen and enables you great convenience. That is why we did not need to think much to decide its place in the same list with the other best touchless kitchen faucets in the market. 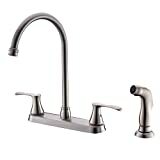 Moen Brantford Touchless Pulldown Kitchen Faucet provides a touch of elegance to your home setup. The only minor issue that we found about this was its super sensitivity, which is not something that cannot be solve. Overall, we liked the features of this faucet. The limited lifetime warranty is another thing that makes it worth buying. Would not that be amazing if you had the convenience of having a faucet which can sense what you are hard to endure or trying to do and respond to your need? Well, to turn your imagination into reality, we present you Moen Arbor Touchless One-Handle Pulldown Kitchen Faucet. This kitchen faucet provides a transitional look that goes well with all decorating styles. A single hole mount provides the cleanest look against custom countertops. The faucet has some innovative features as well. Moen’s reflex system and PowerClean makes your kitchen duties much easier. With innovative looks and amazing features, Moen Arbor Touchless One-Handle Pulldown Kitchen Faucet is tailored to perfection. The only downside is, after using for a while, you might face the problem of leaking. This problem is not quite so difficult to deal with. That is why this faucet is one of the most popular faucets. If you want to bring convenience to your kitchen activities, BOHARERS Touch Motion Kitchen Faucets Polished Chrome is what you need. MotionSense enabled hands-free convenience allows you great comfort with your kitchen duties. The faucet does not costs you a very little, but also saves your money by saving water. It automatically turns off the flow of water after 3 minutes of use. 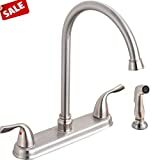 Low price, quality features, an efficient performance the amazing limited lifetime warranty of Boharers makes this faucet a great option for the betterment of your kitchen. BOHARERS Touch Motion Kitchen Faucets Polished Chrome provides a blend of high-quality material, attractive design, advanced technology and strict production process. As an additional output, you get a lifetime warranty. All these things together encouraged us to enlisted this faucet as one of the best touchless faucets. If health is your first priority, LUTAVOY Pull Down Single Handle Kitchen Faucet is the perfect faucet for you. These lead-free faucets are NSF-61 and NSF-372 Certified, cUPC, and AB1953 Compliant. The pull-down spout is very friendly for your kids, or small hands facilitate easy and fast washing of fruits and vegetables. The single level design enables easy temperature control. Dual function sprayer provides quick and direct washing for the best of your convenience. 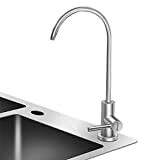 Overall, LUTAVOY Pull Down Single Handle Kitchen Faucet is a healthy addition to your kitchen, that will allow you an optimum level of convenience. NSF-61 and NSF-372 Certified, cUPC and AB1953 Compliant. LUTAVOY Pull Down Single Handle Kitchen Faucet is made for keeping your kitchen works healthy and convenient. User-friendly design, simple use, and quick installation make it one of our top choices. Do you want to enable some futuristic features in your faucet? Wait no more and go for Pfister Electronic Pull-Down Kitchen Faucet! Here is react sensor in this faucet that follows your command just by a wave of the hand. To control volume and temperature, there is the pivot lever. With just a simple push of a button on the spray head, you can choose between a soft stream, spray, and pause. These features are quite attractive, but what might attract you the most is the SmartStop technology. With it, the faucet shuts off automatically after being used for two minutes, and allow you to save money by resisting waste of water. The high-water pressure might cause you some inconvenience while using this faucet, but you will easily get rid of the issue if you follow the solutions we provided above. The faucet indeed is a showcase of simplicity and elegance. 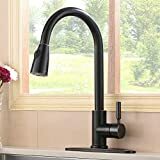 If you want to bring uniqueness to your kitchen, bringing the faucet to your kitchen would be of great value. Hhoommee Motion Activated Bathroom Sink Faucet does not only allow you the convenience of touchless operation but also keeps you away from germs. This saves approximately 70% water comparing to other faucets which make it quite cost-efficient. It provides 30 seconds automatic shut off. 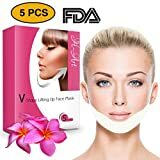 The installation is quite easy, which will reduce a lot of your hassles. The faucet provides a solid brass construction. So, you can expect a long-lasting performance from this faucet. Indeed, we did not find any mentionable downside in Hhoommee Motion Activated Bathroom Sink Faucet. So, we hope that along with the amazing features that we mentioned above, you will get a quite effective performance as well if you choose to buy this quality bathroom sink faucet. Derengge Two Handle Widespread Bathroom Faucet is one of the latest and efficient additions to the faucet market. The bathroom faucet features WaterSense standard and complies with UPC, cUPC, NSF61-9 and AB1953 standard. 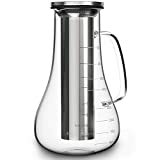 It has a two-handle lever design, which ensures a good control on water flow. Thinking how it would contribute to the elegance of your bathroom? Well, the attractive solid brass body contraction is bound to draw the attention of people. As the leakage issue is not too difficult to deal with, and there are no other mentionable issues, we can come to the conclusion that you would not risk much if you go for Derengge Two Handle Widespread Bathroom Faucet. Indeed, its attractive look and uncountable useful features made us consider it as one of the best touchless faucets in the market. We hope that we are positive as much as necessary to present you an appropriate review of the best touchless faucets in the market. It is time to take the act of making up your mind about something. Let us help you a little more, here are some more suggestions that might help you to choose the right faucet. If you have made up your attention that you would not consider even a little bit about the quality, best options for you can be Moen Arbor Touchless One-Handle Pulldown Kitchen Faucet, and Derengge Two Handle Widespread Bathroom Faucet. If you are searching for a budget-friendly faucet but also want it to be a good one, two fine choices await you. You can go for Derengge Two Handle Widespread Bathroom Faucet and BOHARERS Touch Motion Kitchen Faucets Polished Chrome. Want some elegance? 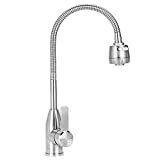 Then you should try either Moen Arbor Motionsense Touchless Pulldown Kitchen Faucet or Moen Brantford Touchless Pulldown Kitchen Faucet. If you need the model that will cost you the least while providing the job, you should better try ITouchless Automatic Sensor EZ Faucet Adapter and LUTAVOY Pull Down Single Handle Kitchen Faucet. We have finished our job, to present our perspective of the best touchless faucets, that we achieved from our thorough research and experience. Hope you will be able to find the best faucet that will match your need and requirements and delight you every time you use it.